Canadian Child Welfare Research Portal- http://cwrp.ca/provinces-territories/ – accessed July 26, 2017. Alberta Incidence Study of Reported Child Abuse and Neglect-2008 (AIS-2008): Major Findings http://cwrp.ca/sites/default/files/publications/en/AB_AIS-2008_MacLaurin_etal_2013.pdf – accessed July 26, 2017. Alberta Incidence Study of Reported Child Abuse and Neglect-2008 (AIS-2003): Major Findings http://cwrp.ca/sites/default/files/publications/en/AIS2003_en.pdf – accessed July 26, 2017. Ontario Incidence Study of Reported Child Abuse and Neglect-2008 (OIS‑2008)- http://cwrp.ca/sites/default/files/publications/en/23013_OIS-2008_v10_August_19_2013.pdf – accessed July 26, 2017. Ontario Incidence Study of Reported Child Abuse and Neglect – 2013 (OIS – 2013) http://cwrp.ca/sites/default/files/publications/en/ois-2013_final.pdf -accessed July 26, 2017. Quebec Incidence Study 2008 (EIQ-2008): Final Report http://cwrp.ca/sites/default/files/publications/fr/Rapport_EIQ-2008_FINAL_23_nov.pdf -accessed July 26, 2017. Child welfare data are collected and reported differently across Canada – therefore they are not necessarily comparable. 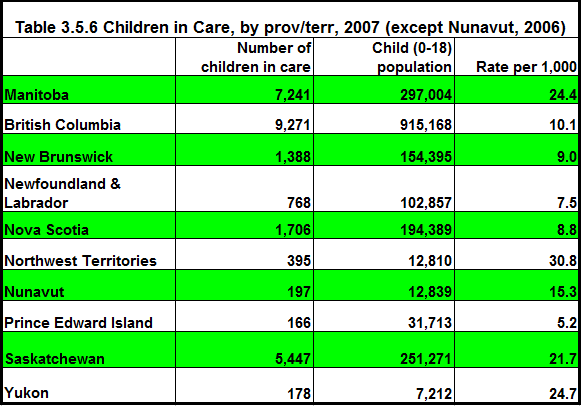 These tables reflect the children in care in some provinces/territories.